Place the minced pork, fish paste, chopped shrimps, onions and spring onions in a mixing bowl and marinate with the abovementioned sauces. Mix well until everything is well combined. Cut the beancurd skin into 14cm by 9cm and set aside. Use a damp clean cloth to wipe away the excess saltiness on the skin. Mix corn starch water to seal the edge of the roll later. Place a tablespoon of filling in the centre of the beancurd skin. 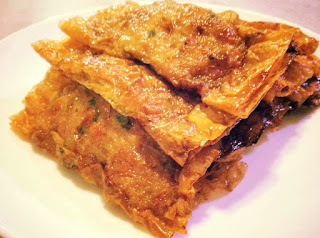 Apply some corn flour water, fold beancurd skin over the filling, roll over to meet the other side. Using fingers and press lightly on the roll and flatten it. Repeat with remaining beancurd skin and fillings. Heat up the wok with oil. Working in batches and under low fire, place rolls in oil and fry, turning occasionally, for 5 minutes or until beancurd is golden and crisp, and filling is cooked through. Remove from the wok and drain on paper towel. Serve hot with sweet chilli dipping sauce.